A group of white rabbits found Excalibur and met Julius Caesar, and now they're in the Wild West taking on outlaw Billy the Kid. 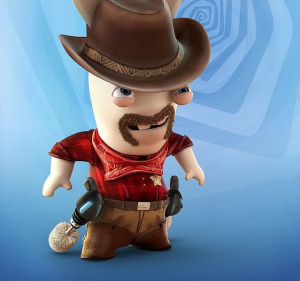 It can only be Raving Rabbids: Travel in Time. 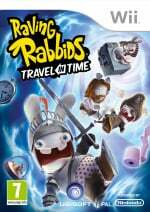 The first online-enabled party game in the series, Travel in Time plots a course through various times in human history and lets the Rabbids have their chaotic way with any and all characters in their path. There's also support for Wii MotionPlus for extra precision, the ability to customise your Rabbids and of course a stack of new minigames. It also contains a Time Washing Machine, in case that sways you. Bored of rabbids now. They were funny 3 years ago. I'm with Raylax, I've bought all of the Rabbids games thus far but shan't be buying more. I'm with Machu, I've bought one Rabbids game and hated it. Whoa whoa whoa, I liked the games, I've just had my fill. Yeah, 1 game a year is a bit much. Funny enough, I've seen Rabbids Go Home for £5 today, might nab it if I get some moneys. Is it stupid for me to comment on how Billy the Kid actually looked NOTHING like that? If so, I'll just reiterate how disappointed I am that this is just another party game and then be on my way. Have all the Rabbids game. Pretty big fan of the series. The fact that there's online this time excites me to bits. I think the game should end with a trip prior to the formation of Earth forcing them to aphyxiate in the emptyness of space. Hopefully after that, Rayman can finally pull a Metroid 2 on the rest of them. That's a Rabbids game that I would get. I have owned all the Rabbids games myself. I only own Rabbids Go Home (the best game) now though as the others have been traded in. May get this when its bargain binned and pending a review. Too many games in front of this. I would be tempted to buy (or rather re-buy the RRR games as) the RRR Trilogy set if all the games were unlocked and you didn't have to go through the story mode. I would get another decent Rabbids platformer as well as a Rayman one...IF they turned out decent. I'm still angry this is a party game. Last year's Rabbids Go Home seemed like a step in the right direction. It sounded like Rabbids Go Home was gonna be the last one... but we were wrong... oh so wrong. Where for art thou, Rayman? I never liked Rabbids even when they were first invented, I sure as hell hate them now. Rayman has been such a disappointment after the first game. Hopefully that new one will change all that though.